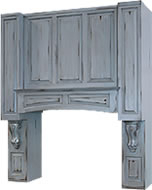 "Shiloh produces kitchen and bath cabinetry with the customer in mind. Our cabinetry is designed for the kitchen or bath, entertainment room, or any other area in the home where cabinets are needed. This website details our quality cabinet construction methods and Shiloh's complete array of finish colors - over 250 and growing. We offer custom options and numerous accessories, without the custom price tag. We encourage you to compare our construction, finish selection and options to other cabinet companies. 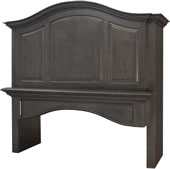 Just visit one of our dealer showrooms and experience why Shiloh Cabinetry is "Elegance in Wood"." Shiloh Cabinetry offers six wood selections and a thermafoil product. Their cabinets come in oak, hickory, maple, knotty alder, clear alder and cherry. 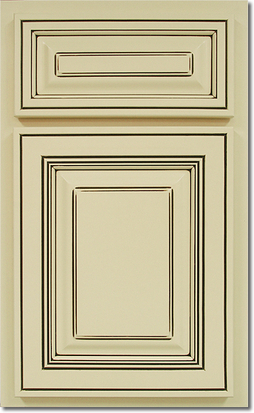 In addition to these six wood selections, we offer thermafoil doors and drawer fronts on painted maple face frames. The same all-plywood box construction applies to our thermafoil products as well. Each wood selection has its own unique characteristics, so we have described each one to help you better understand real wood before you buy. 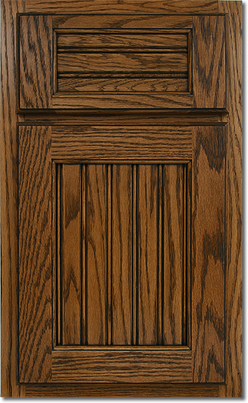 Hickory: A very hard, heavy wood known for its extremely bold and distinct open graining and color variations. A single board of hickory lumber can have several color variations from almost white to dark brown and black. Dark mineral deposits are common. Extreme color variation is expected in hickory and that is what gives hickory its charm. Knotty Alder: A medium density hardwood with soft, straight grain, and even texture. Knotty Alders natural color ranges from pale yellow to reddish brown. Knotty Alder is chosen for its rugged appearance. Knots will be random in size and distribution and will range from tight sound knots to very rustic, split, and open knots. Clear Alder: A medium density hardwood with soft, straight grain, and even texture. Clear Alders natural color ranges from pale yellow to reddish brown. Clear Alder may contain small pin knots. These characteristic markings are blended naturally throughout the cabinetry. Due to the soft nature of Clear Alder it is susceptible to dents moreso than other hardwoods. Cherry: A slightly hard and relatively light wood known for its tight graining and elegant coloring. A frequently occurring feature specific to cherry are its gum pockets, otherwise known as pitch pockets. They are small black flecks or streaks in the wood caused by dried sap pockets. Color varies from almost white to light brown to pinkish red, giving it a wider variation in color than most people know. 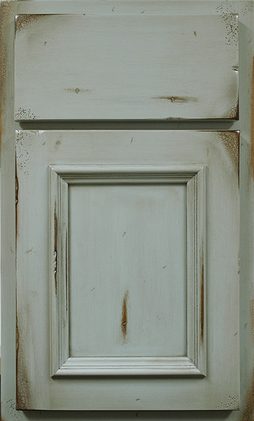 Lighter stains will show this variation, so the buyer should be aware of this characteristic. Another very important characteristic of cherry is its sensitivity to light. Cherry will darken over time with exposure to any light, especially the sun. This darkening will happen with all cherry and even after it has been finished. Understanding the aging process of cherry is important before purchasing this beautiful wood. Select American Poplar: A fine grained, medium density hardwood with straight and lightly figured grain patterns. This hardwood is less dense than other hardwoods such as maple or hickory, thus, is more susceptible to dents and dings. The select material is light cream to tan in color. In select varieties, heavy green or mineral are defected out. However, some light green or small amounts of mineral streaks may be present. These subtle color variations add character to the wood.